Exploitation films and B-Movies are enjoying a higher profile than ever thanks to the efforts of filmmakers like Robert Rodriguez. The questionable quality of his films not withstanding, one has to admire his commitment to his vision. In a way, his films are every bit as personal as the higher brow offerings usually favored by critics. Rodriguez works on controlled budgets and makes exactly the kinds of films he wants to make. In that sense he is living the dream. The relative failure of 2007's Grindhouse might have frightened a less resilient filmmaker, but Robert Rodriguez remains steadfast, opting to crank the volume up full blast and forge ahead. If he fails, at least he does so by his own hands. 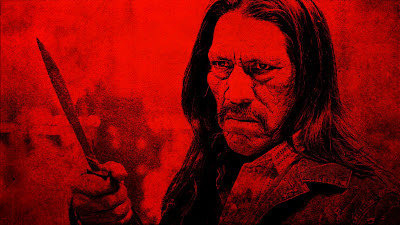 The idea to turn Machete into a full blown feature struck me as gimmicky fanboy pandering when I first heard it. It would be hard for a feature length film to maintain such a tone throughout it's duration, much less find a worthwhile story to saddle it to. That kind of novelty works just fine for a couple of minutes, but a full length movie? Even if Rodriguez was able to fashion a serviceable action movie out of the concept, it would most assuredly only play to the converted. The converted in this case would be the legions of fans who giggled with glee as the original fake trailer on which the film is based played in front of Grindhouse three years ago. Fortunately, each subsequent piece of advertising for the film has slowly warmed me to it. Now, with this red band trailer I am completely sold. The film clearly does not take itself seriously, featuring the sort of cartoonish carnage that would be right at home in Riki-Oh: The Story of Riki. Machete (Danny Trejo) is seen repelling out of a window using someones intestines as a rope. Limbs are severed, brains are splattered, bare breasts are displayed and lead flies in all directions. The whole thing comes off like an ultra violent three ringed circus. We also get some prominent shots of Steven Segal in what looks to be a major set-piece. There isn't one unappealing moment in the whole thing. Watch it at your own risk, and be careful not to get any of the burgundy colored stage blood on your clothes.